Rich Guy was supposed to be leaving on Thursday; but extended his stay for another 2 weeks. This seems to be a reoccurring theme. That's why we quit throwing him going away parties. He would leave, then come back, leave, comeback and so on. Soon he had a stash of going away gifts and many free dinners. We were wondering if he just doing it for all the freebies. No wonder he is a Rich Guy! Tonight, Vandelay and I took him out to celebrate his birthday since he is rarely here on the date itself. At least we think it's his birthday... Rich Guy likes Izakaya; so we headed off to Guu with Garlic. Much like the other locations (with the exception o f Aberdeen), it's small and very busy. We ended up waiting for about half an hour. The table we got was a small table for 2. That really wasn't the problem; rather, we had to sit on the floor. I haven't sat this much cross-legged on the floor since Elementary. In Japan, Izakayas are not normally a place where you'd eat dinner because it is mostly intended for drinks and small bites after work. It's a similar to how we find big plates of pasta for one person here whereas in Italy, they would share it. Let's just say that food gets interpreted differently here for the local market. Thus, to actually get full off of Izakaya food, we ordered 11 dishes to share. Normally, in a place such as Kingyo and Hapa, you'd be looking at quite the hefty bill afterwards. 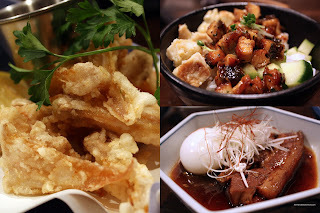 However, at Guu, the prices are more reasonable and the portions are decent. Gyoza King, which is a block away is quite similar in pricing as well; but they are super busy and the wait for a table might take even longer. sesame dressing. Basically, this dish is an examination in textures rather than flavour since shark's fin and jellyfish do not have much taste on their own. A bit chewy and crunchy, it was lightly seasoned; a great way to start off the meal. Also, you will only find this dish at Guu with Garlic, the other Guus do not serve it. The Kimchi Udon was next and I was a bit apprehensive since I did not enjoy a similar dish at Hapa. The addition of cod roe made that particular dish a bit fishy and slimy. This time around, it was better here at Guu; but still not my favourite. At least the udon were not slimy in this instance. Next up was the Gindara (Black Cod) which is marinated in miso, grilled and topped with mayo. The fish was buttery soft and had just enough flavour that it did not overwhelm the fish. I didn't think the mayo added much to the dish since black cod itself is an oily fish. One of my favs is Takoyaki and naturally I had to order it. Fluffy on the inside with pieces of tender octopus and slightly crisp on the outside. There was just enough sauce and mayo with bonito flakes and nori. 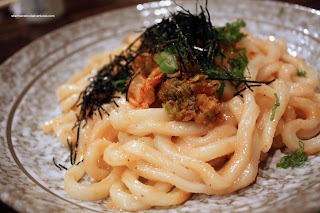 Another favourite that I ordered was the Ebi Mayo. The shrimp were plump and fried up nicely with a huge pool of mayo on the bottom. I'm glad it was not on the top. I like some mayo; but not so much that you cannot even see the ebi. Rich Guy ordered both the Salmon and Beef Carpaccios. I originally wanted a Beef Yuke; but I didn't see it on the menu. Didn't matter anyways, Rich Guy did not want raw beef and raw eggs together. The salmon carpaccio was good, the fish was fresh and the light soy dressing didn't detract from natural sweetness. 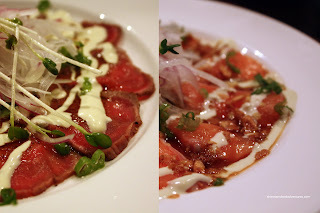 I liked the plum dressing for the beef carpaccio, it added nice sweetness to the tender slices of meat. case was a seafood and veggie pancake. It's pan fried and dressed in a tonkatsu sauce with wasabi mayo. This was a pretty standard version. I would've preferred that it was a bit fluffier; but it tasted good nonetheless. At this stage, we had a bit more room left in our appetites and ordered 3 more dishes. Vandelay really wanted the Buta No Kakuni or stewed pork belly with egg. This is not a dish if you were watching your weight. Yet, there is nothing better than tender pork belly. This reminded me of the Chinese version which is accompanied by pickled mustard greens. The stewing liquid helped bring a sweetness and richness to the belly. The soft boiled egg was a nice treat at the end. Although, it was a bit difficult to share. Imagine splitting a runny egg amongst 3 people. I've seen deep fried chicken knees before; but this is the first time I've ever ordered Deep Fried Chicken Cartilage. It consisted of deep fried breast bone cartilage and was served with roasted salt. It was indeed interesting; but didn't really encourage me to order it ever again. The last dish was the Unagi Meshi or eel rice with cucumber, egg topped with a kabayaki sauce (which is basically unagi sauce). The rice was firm, the unagi plentiful and the cucumber gave a nice crunch. Once again, another solid meal at Guu. So far, it seems that this location is the better compared to the Richmond and Thurlow locations. I have yet to try the Gastown one; but you know I will! As for my legs, they were numb after sitting in an awkward position all through the meal. However, I was pretty pleased with the food and the incessant yelling of orders from the wait staff (it's how they do it here). For me, that erases all thoughts of pain. LOL... I'm 6'1 and sitting on the floor sux... I'm sure you fit much better than I did. I still haven't been to Guu with Garlic! 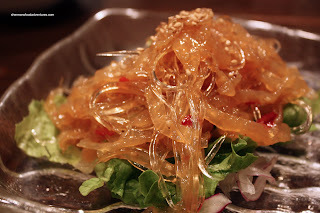 I just went to the Guu at Aberdeen a couple weeks ago...the food looks really similar. I agree - the prices are nicer at Guu...izakaya gets so expensive..but I totally have a soft spot for it. Did the Takoyaki have squid and shrimp as well? Oh, you must go to the downtown Guus. The one in Richmond is a bit "watered" down comparatively. The Takoyaki only had octopus. I agree with the soft spot comment. I love Izakaya and I am willing to pay for it. Even if it means going to Kingyo which is $$$. Okay Kim, deal! Next time, I'll give you a shout! Hey Anita, Guu is indeed very good. I like this location the best, but obviously I need to go to the Gastown one to make sure!